Hubby and I are today off for our first night away together, with no kids, for 6 years! As we were ploughing North, I was doing that whole parental torturing myself thing. I know that there are plenty of sensible parents who have done this regularly since their peeps were born, and are probably in a much more balanced parenting place than me. In fact they will be wondering why this is such a big deal to me. You see, I have never left my children overnight since I gave birth to them. I think I am one of those mothers who have really bloody bossy hormones that simply insist that I do what they say. For example, I was suffering from severe mastitis while feeding the twins. My GP immediately called the hospital to arrange admission and IV drugs as my temperature was so high and I was so poorly. I was fine with that until they said the twins would have to stay at home as they couldn’t arrange a double cot on the right ward. I asked for a prescription for oral antibiotics then took my twins home again. I simply could not bring myself to be parted from my babies. If one of my children has hurt themselves, I have to be there, and I have to be the one comforting them. I will forcibly extract them from anyone else who is trying to comfort them. This is entirely irrational, but is an emotion or instinct so strong that I have absolutely no control over it. Some people will think, bloody hell, overprotective control freak. Others will relate entirely, and some people will take more of a middle road. When hubby presented me with the hotel room pictures and proposal for a night away, I was initially super excited, then worried, then excited, then worried, then I was going, then I was not, then I was….! You get the picture. Anyway, finally, we are going. Hotel booked, I packed my bag. – They (kids) will be fine. – It’s good for them to learn some independence. – Did I show the babysitter where the Calpol is. OMG what if she gets the dose wrong? – She won’t because she is the most responsible adult we know, and anyway no-one is going to need Calpol. – What if the baby monitor stops working and she doesn’t hear someone crying for ages? – Stop being stupid. You know how loudly your kids cry. Frankly even with earplugs in it would be a struggle to miss them crying! -It’sonly 24 hours. They will hopefully be in bed for around 12 hours of that. – Oh no, what if Lucy has one of her fits (febrile convulsions) and has to go to hospital? – It’s ok, we have been through the drill a hundred times. The hospital is about 3 minutes away. – I won’t be there for special time. What if this damages my older children’s development or parental trust? – I will probably even get to read a newspaper at breakfast tomorrow. In fact, I may even get to eat breakfast tomorrow without having to leap out of my seat every 3 seconds to see to someone else’s demands. – Hot coffee, the act of pouring and drinking taking place within an hour, and temperature being more than tepid. I AM SO EXCITED! – What if the twins just won’t go to sleep as Daddy always puts them to bed? – Dinner, with wine and adult conversation and no baby monitor….I guess they will eventually cry themselves to sleep! – That’s it, I won’t enjoy it as I can’t stop worrying. Let’s just call it off, turn round, and go home. Then hubby entered a wiggly road with twists and turns. At just at that moment, a really irritating little voice from the backseat started giggling “Mikka Makka Moo” on repeat. 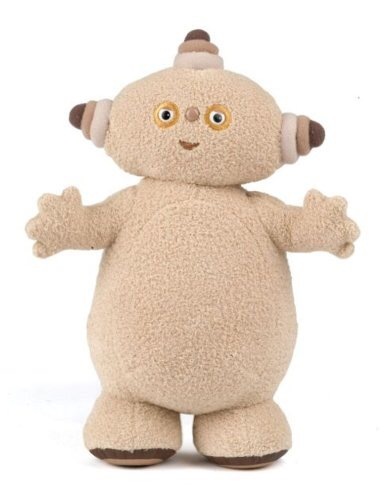 Somehow, we had managed to bring the singing Makka Pakka with us. The one with no off switch. At that point, I thought to myself, you gave birth to 4 children in 3 years, and have never had a night off. You have even managed to take a singing bloody Macca Pacca with you on your first night away. We are not going home! We will be there in around 40 minutes, and I think my first stop will be the child free bath!!! Oh my days, I’m exactly the same! Although my twins are only 26 months. But I’ve never left them and the thought of it really throws me into emotional turmoil. The other day the hubby said he had planned for his mum to have the twins for a couple of hours yesterday so I could get on with whatever it was I had Mentioned in passing that I wanted to do – I was horrified! Both by the fact that my hubby had taken it upon himself to arrange my day for me (! ), but mainly because, whilst I always think I’d like a break from them, I actually hate the thought of them spending any time with someone else without me there! And I’m not sure why I think like that. Like you, what if something happens – I want to be the one there for them; what if the person in charge (yes, even their nanny!) says Something to them that I disagree with (for example I don’t like them being called naughty boys – they’re still learning and there are other ways to explain to them, but she says it often) and I’m not there to Correct what she’s saying to them? What if she can’t handle them both fighting, crying arguing? What if they have an accident and I’m not the one there to comfort them? It’s endless. Needless to say one argument later he cancelled his arrangement with his mother and agreed not to make plans on my behalf again in future! But here I am 26 months in, and the most I’ve left them for is up to 2 hours with the hubby, and a hour with my own mum (I at least know with my own mum that we sing from the same hymn sheet when it comes to child Rearing). Who knows when I’ll feel happy leaving them – maybe a few more years like yourself. Got to do what you’re comfortable with when it comes to your own children haven’t you. Hope you enjoyed your night away! Oh bless you. It’s really tough. My twins are also 26 months, snap! Mine were 1 October 2013. What about yours? We had a lovely evening and a peaceful night, although I woke lots of times wondering if I could hear a child crying before realising where I was! The only call was from the au pair to ask if her boyfriend could come over so that’s a relief! By the time my eldest was 3 (now 6) I was coming home from work to hear stories like ‘H (nanny) always leaves us alone in the bath’, ‘H says we don’t have to wear our seat belts in the car if we are not going very far’ and ‘H makes me eat grass for dinner!’. Needless to say, I investigated and none of this was true. It was interesting that at only 3 years old, he knew exactly what would worry me the most! Sorry, I’ve literally just discovered where i find comments and replies! Oh mine were 8th November 2013, which makes me think more that I’ve been ageing them wrong all this time! Ha Ha! Glad you enjoyed your night, even with the phantom cries! That should say makes me think *now.